Using Hobo With Rails 3 and MySQL! For my college project this semester, We (me, Damodar "Damu" Dukle and Poonam "Patlinbai" Patil) chose to use Ruby on Rails, a framework that has been used to create tonnes of stunning webapps. As a developer, Ruby on Rails (or RoR) has been of great interest since the "Convention over Configuration" philosophy RoR emphasizes upon leads to a quick, non-repetitive coding. For the backend, we decided to stick with MySQL, a SQL that all 3 of us are experienced and comfortable with. Now for our project, we'll be designing a webapp called Press Play, a sort of Napster meets Last.FM meets SoundCloud mega-mashup... more on that some other time (probably once we finish it). The following is a simple tutorial to get up and running with Hobo on Rails 3.x. 1. Setup Ruby and Ruby on Rails. Follow this tutorial if you need to. 2. Next step is ofcourse to install the Hobo gem. Now there's a small issue here. If you use the stadard gem install hobo command, it installs Hobo 1.0.3, which is incompatible with Rails 3.x. Hence we use the command gem install hobo --pre , which installs a prebuild of Hobo 1.3.0, which is compatible with Rails 3.x. 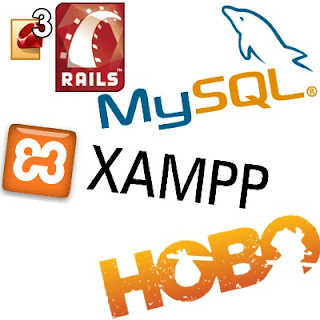 Navigate to the XAMPP install folder ->mysql ->bin (Generally C:\XAMPP\mysql\bin) and then copy the libmysql.dll file. Paste it in the Ruby install folder-> bin (Generally Ruby192/bin). Overwrite if you need to. Now is where Hobo shows it's strength... the Hobo Setup Wizard offers to run. Let's have a look at it shall we? Do you want to start the Setup Wizard now? Next up is a name for the user resource. If you;re writing a movie webapp, you may want to use the term "moviebuff" instead of "user".. For now, I'll stick with "user"
You know how those fancy sites send an activation email when you create a new account? or those sites which are invite only (Did someone say Google? :P )? Well, using Hobo, you can have both those features with complete ease! Will your application use only hobo/dryml web page templates? OK, it's all done. Let's take the site live shall we? Let's migrate our database schema to MySQL. As it;s been throughout, it's a completely hassle-free process. Just choose your database migration option as 'm'. t.string :state, :default => "active"
Hobo even asks you if you want it to set up a git repository for your new project and git init it! Follow the guidelines to start developing your application. Yeah, a site with user authentication, individual profiles and hashed passwords all ready for you, and you haven't written a single piece of code yet! The first account created is given administrator priviledges, and priveledges of all other accounts are decided by this account. Now it's all about customizing it as per your preferences... Check out some of the sites that were born exactly as your project right now: http://hobocentral.net/gallery/ ... Amazing eh? I'd strongly suggest that you download Rapid Rails With Hobo, a free ebook of Hobo tutorials. Examples in the book make use of an older version of Hobo, so commands may not work out of the box, but it's still an excellent read! Also check out the Hobo cookbook for ideas on what can be achieved using Hobo.